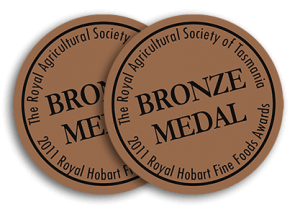 Results for the 2011 Royal Hobart Fine Food Awards Coffee Competition were announced this week with three coffee producers from the Northern Rivers gaining awards for their coffee. Kahawa Estate Magma won two bronze medals in the “Single Origin Espresso” class and the “Cappuccino Classic International Style” class. Kahawa Estate Magma was awarded two Bronze Medals at the 2011 Royal Hobart Fine Food Awards. The coffee competition attracts Australia-wide entries of some of the world’s best coffees and is one of Australia’s most prestigious coffee judging events. Hundreds of coffees (mostly imported beans) from roasters all over Australia were entered in several different Classes. The offerings from the different roasters are judged to internationally set criteria by a panel of judges who are experienced in coffee roasting, blending and cupping. The judges see only entry numbers and are not allowed anywhere near the store room or area from where the coffee beans are dispensed. Australian Subtropical Coffee Association President, Jos Webber, said “the awards were an indication that great tasting coffee is now being consistently produced by local growers. Our Association, which represents most of those involved in the local coffee industry, has been focussing on developing the distinctive flavour qualities of our sub tropical coffee. Our success in this year’s show is a very pleasing reward for our efforts”. While he was pleased with the results from the Fine Food Show, Jos was anticipating a bright but challenging future for the local coffee industry. “The awards are likely to further increase the demand for our coffee and create supply challenges for us”, he said. “The 40 or so local coffee growers are generally finding it difficult to keep pace with a growing market. Fortunately there have been good harvests for the last two years and it looks like we will have another good year. But we are keen to see the new plantations that are presently being developed come into production”.